May 2016. Faber-Castell Pitt Artist pens on paper. 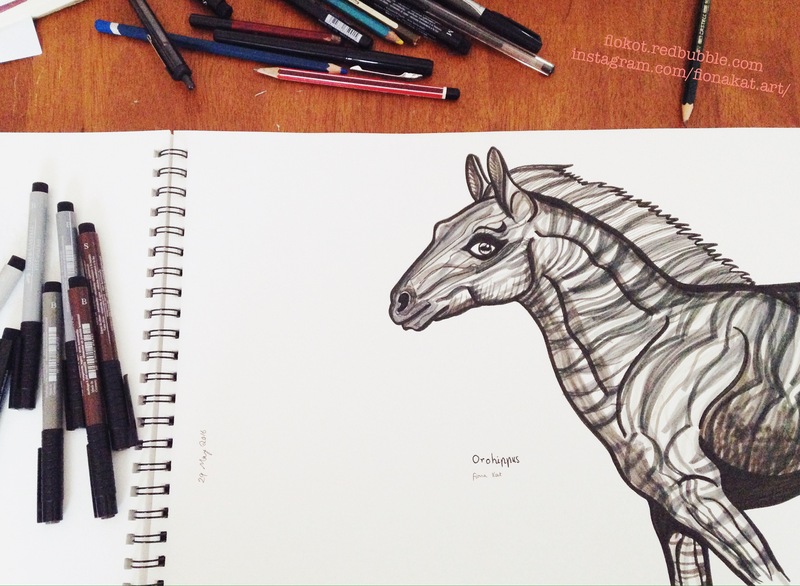 Posted in animals, art, palaeontology and tagged art, australian artist, equine, horse art, orohippus, palaeo art, sketchbook on May 31, 2016 by Fiona. Some speculative sketches of Coelophysis with proto-feathers. I am trying to get up-to-date on where dinosaur palaeontology is at these days, as much of what I learned as a 12-year-old dinosaur nerd is somewhat out of date. No longer are these critters considered the cannibalistic and scaly monsters I knew of as a child! What an exciting time to be alive, though, to observe from my layperson’s distance the evidence for feathered dinosaurs that was, in my childhood dinosaur books, largely speculation. Posted in animals, art, palaeontology and tagged Coelophysis, dinosaur, dinosaurs, feathered dinosaurs, palaeontology, paleo art, paleoart, saurischian, theropod on April 15, 2016 by Fiona. I just had to share this snapshot I took of the latest issue of Scientific American (May 2015, Vol. 312, Issue 5). We subscribe to this magazine and I was very excited to see some of artist James Gurney’s work gracing the pages in a fascinating article about the palaeontology of the tyrannosaurs. The animal on the cover is the Chinese genus Qianzhousaurus. James Gurney is, of course, the artistic and literary genius behind one of my all-time favourite books Dinotopia: A Land Apart From Time (1992). Posted in animals, art, palaeontology, science and tagged art, dinosaur, james gurney, magazine, palaeontology, paleo art, photograph, qianzhousaurus, science, scientific american, tyrannosaurus on May 14, 2015 by Fiona.